It’s been a full year since The Orioles took flight as the newest species of birds in the rock nest and the results have been overwhelmingly successful both commercially and for the most part – at least when they stuck to rock – aesthetically as well. Prior to their arrival rock vocal groups had consisted of The Ravens as the form’s standard bearers while the rest of the roster was rounded out by a rag-tag collection of acts who it can be safely said stumbled into the rock field by accident rather than set off to conquer it by intent and the underwhelming results of most of those aggregations proved that. The Orioles were the first who intended to make their name in rock from the very beginning and as befitting a group whose average age was barely 21 they perfectly encapsulated everything the rock fan themselves, who were the same general age and from the same cultural environment, needed to validate their worldview. The group’s rise to the top perch was remarkably quick as their debut topped the charts and was subsequently confirmed in a series of equally popular follow-ups that now assured their releases would all be sought out by the same loyal constituency, almost guaranteeing a level of sales that would make them perennial stars in the rock field for the foreseeable future. Yet their rapid rise wasn’t without its missteps as the group and their record label too often seemed to see their successes as anomalies and tried steering them back towards the more mannered lite pop fare that previous generations of black vocal groups had succeeded with and which no doubt appeared to be the more bankable route than the emotion laden records The Orioles had all but defined in rock to date. However with their last effort, a gut-wrenching emotional rock ballad of the highest order which was now sitting a top the charts leading up to this release there seemed no doubting the direction they SHOULD take from now on. But as we know all too well old school mindsets are often the hardest to break and so until The Orioles and Jubilee Records proved they’d learned their lesson and would stick to the field they did so well we’re always going to have to take a wait and see approach before committing to their creative advancement. We’re still at the point where the record industry eagerly covered any song that showed sales potential, hoping for a piece of the action. Though this happened slightly less in rock circles than in pop they still weren’t immune from it. Virtually everybody and his sister cut a version of Paul Williams The Hucklebuck, while Wynonie Harris and Big John Greer both copped Stick McGhee’s Drinkin’ Wine Spo-Dee O-Dee which was currently in the top ten, and now the venerable Orioles saw fit to clip the wings of The Four Jacks’ rising hit in an attempt to score one of their own. Though hardly admirable creatively, it was widely accepted and so in our ongoing effort to always take context into account we have to view it as par for the course and judge it less on the merits of originality and base our response more on how they adapted it for their own needs as well as the needs of their audience. First the background on the original rendition by The Four Jacks, a name used by multiple acts over the years including a rock group in 1952 on Federal that we’ll cover in due time. 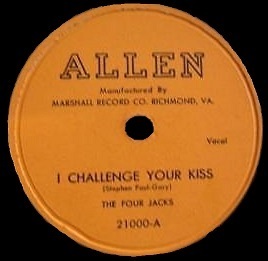 But these particular Four Jacks were out of Virginia recording for local label Allen Records and were led by Jimmy Root, a piano player who backed gospel acts Sister Rosetta Tharpe and The Pilgrim Travelers. The other members were all gospel singers but on this particular song they seem clearly schooled in pop. Their phrasing, the open throated harmonies they employed and Root’s dainty piano accompaniment gave notice that they certainly weren’t aiming at rock acceptance… though of course at times The Orioles were guilty of the same techniques and – regrettably – the same mainstream pop aspirations. The Four Jacks version was released in early spring and charted nationally in Billboard on May 21. By that time, actually a month before that, The Orioles had jumped on it (being from nearby Maryland it’s no wonder they heard the Virgina’s group record as soon as it hit the streets) but with their own recent release, Tell Me So, storming the charts Jubilee Records held The Orioles take on it until they were at risk of losing out on any action the more the original gained spins of its own. 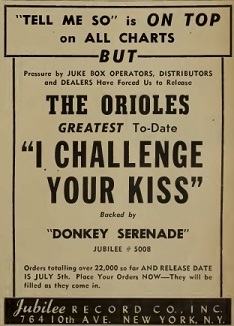 Cockily, and disingenuously, the ad promoting The Orioles version states “Pressure by Juke Box Operators, Distributors and Dealers” forced them to release theirs early and so on July 5th the hottest vocal group around went head to head with a novice act on the same song… and promptly lost the battle in the public’s assessment. The Four Jacks got the bigger hit, peaking at #8 in a three week stay, while The Orioles topped out at #11 in just a lone week on those listings, this despite coming off a #1 hit and being far more well known. The Four Jacks would release only one more record in their short-lived career but nonetheless we can remove some of the uneasiness regarding the cover practices because in this instance the unheralded originators won out. Justice, if that’s how you define it, was served. But the real litmus test for whether this effort was a success can’t be found in merely looking at the chart results but rather listening to the records, specifically how well did The Orioles do in their own take on I Challenge Your Kiss and was it worth them risking their souls by horning in on a gospel-based act to try and steal a hit? The first change, and an unexpected one considering The Orioles previous reliance on the piano, is the intro played on an electric guitar. It’s nothing scintillating by any means, it’s very brief and subdued actually, but it has a nice tone that eases us into the proceedings. It also helps to distance it just a little from the piano-led Four Jacks take on it, though a piano does appear fairly quickly on The Orioles version of I Challenge Your Kiss as well, showing that they’re not about to completely reinvent the song even if they weren’t averse to tweaking it just a little. Where this becomes most apparent is in the lead vocals of Sonny Til whose deeper voice is loaded with sultry undertones that the older Four Jacks, trying not to draw the scorn of whatever religion they plied their trade in as gospel singers, can’t hope to match. Sonny Til is ALWAYS going to be the ace in the hole for The Orioles in whatever they tackle and they knew well enough to take advantage of it each and every time out. (Well actually they didn’t in only one instance, which just so happened to be the flip side of this record which features the only Orioles lead done by anyone but Til in their heyday, as George Nelson handles the task on the utterly indescribable Donkey Serenade a record that fits in no genre other than the bizarre, so we won’t be covering it here, but is worth checking out just to try and make heads or tails out of it). We’ve seen the key to connecting with a vocal group hinges on an identifiable lead, Jimmy Ricks with The Ravens being the most noteworthy of course, but Til’s devastating emotional commitment to most everything The Orioles did isn’t far behind when it comes to leaving their mark on the material and this is no exception. On the original take of this The Four Jacks seemed curiously removed from the real life implications of the lyrics they sing. When they ask “Could I adore you?” it doesn’t come off as a request for a girl’s heart as much as it does a literal question they’re asking of themselves regarding their own ability to express genuine affection. Ahh, but such were the constraints artificially imposed on pop singing, particularly black pop in the 1940’s, where any display of actual desire was to be reined in for fear of offending somebody. The Orioles thankfully have no such limitations to deal with in their reading of it and Sonny Til lets you know that HIS urges are a bit more primal. But while his longing is expressed with a more realistic sense of inner arousal the framework the song is presented in prevents him from doing more than merely alluding to his aching need for her in his life. It’s still a form of repression in that way, even as Til himself strains against these confines, something that is a concession to either the conservative society they didn’t want to provoke, or a bow to their own stabs at pop acceptance. Come to think of it those are probably one in the same. The others deliver a pleasing bed of harmonies, topped by a haunting falsetto by Alex Sharp, but they offer no outlet for Sonny to break free of the melody, or to break free of the excessively mannered politeness it’s cloaked in. Though their performance is much more authentic than The Four Jacks in terms of the emotions it suggests, it’s still not entirely believable in what they’re attempting to convey because they’re forced to hold back too much. Could I Adore You More Than This? If we’re to buy into Sonny Til’s all-consuming passion for this girl in question then he needs to be at least on the verge of losing control as he tries to express this to her, to really convince her of his devotion in the hopes that she’ll respond in a way that leaves no doubt in his mind that she is his for eternity. Though the song itself is rather flimsy as written there’s still a lot that could be done to ratchet this up and make it much stronger simply by shaking up the arrangement. We’ve seen how this is done in so many rock instrumentals of this era where the piano and larger horn section play things cool, keeping the pace at a modest clip before the tenor sax barges in and honks up a storm, upending the entire mood and causing listeners to jump out of their seats and shake their bodies like they’re doing the St. Vitus Dance. The same approach could easily work here if instead of handing the same stanzas over to Nelson’s baritone in the birdge, as was their fallback position on every song, they instead let Sonny himself cut loose, his emotions overwhelming him as he delivered the same lines with unbridled passion, ramping up the pace while the others respond to his increased passion by putting more of their own souls into the harmonizing, almost urging him on in a way. We know Sonny is more than capable of this technique thanks to his more unrestrained work on Deacon Jones and if ever there was a song that needed a sudden shift in tempo and urgency it’s the staid I Challenge Your Kiss, a pretty tune but also a pretty mild song that borders on dull when boiled down to its base ingredients. Til’s vocals elevate it as well as can be expected and Nelson’s role gives it a slight jolt but it falls well short of what it had the potential to be if they all had more grandiose ambition. The fact that The Orioles were clearly sticking to a rather limited basic formula – ponderously slow ballads with storylines all voicing uncertainty in matters of the heart and left to the redoubtable Sonny Til to invest it with as much smoldering lust as he could get away with all while never taking it out of first or second gear – meant that they were constantly at risk for becoming one dimensional. 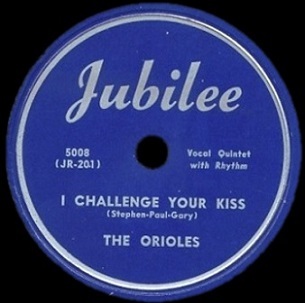 Yet as one dimensional unoriginal cover songs go I Challenge Your Kiss is still pretty nice to listen to, though hardly anything to get worked up about if you were an Orioles fan anticipating something far more powerful. Indeed that this was rather surprisingly beaten by The Four Jacks’ original on the charts in spite of it coming at the peak of The Orioles popularity shows how vulnerable their hold on their audience was shaping up to be. It’s a problem The Orioles never fully addressed and thus never managed to solve. Their early overwhelming success in such a distinctive approach took away their need to keep experimenting and while I Challenge Your Kiss was likely a disappointment sales-wise considering their reigning position in the rock community at the time, it still was a confirmed hit and thus only further boxed them in when it came to exploring more varied material. Though Sonny Til did this type of thing better than anyone and that alone makes this an important record in the big scheme of things in rock circa 1949 when you needed to have a wide variety of approaches present to keep the music as a whole as well-rounded as possible, it doesn’t offer us anything new. Worse yet is the growing realization that the group was always going to be overly reliant on finding languorous ballads with instantly appealing melodies to carry the similar concepts and since those are hard to come by it was going to be a more of a hindrance for The Orioles as time went on. With both sides of each single (six to eight a year on average) constantly trying to tap the same vein it only stood to reason that eventually they’d bleed it dry. As styles evolved, as new concepts were ushered in by others seeking to carve their own niche in the field, The Orioles remained fixed in place and while they can never be denied credit for providing the crucial prototype they introduced for this particular style they shortchanged themselves in the long run by obstinately sticking to it almost exclusively rather than expanding their reach while the ears of the rock audience were still fervently fixed on their records. Taken alone I Challenge Your Kiss holds its own in the rock world of mid-1949, a nice change of pace to compete with the more rambunctious instrumentals, raunchier solo singers and steady stream of rhythmic ventures coming from all sides. It provides listeners with something they were still craving and its modest success probably justified their decision, at least in their own minds. But with their standing assured The Orioles were now competing with themselves as much as with other artists from all walks of the rock landscape and it was in that sense they were coming up short. The mere fact they were looking to swipe songs from rivals just starting out gave some indication that their own creativity was lacking. The bar had been raised by their own successes, both stylistically and commercially, and it was against that standard where the inherent limitations of modest cover songs like these would be most apparent. Leave a reply on "The Orioles: “I Challenge Your Kiss”"